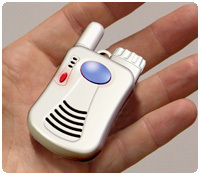 Logicmark Freedom Alert Emergency Alerting Device is a programmable two-way voice communicator that allows user instant two-way speaker phone communication through an emergency alert pendant. This system is designed to give complete freedom of instant communication and reliability during an emergency and provide total protection anywhere in or around home at all times with one button activation. Logicmark Freedom Alert with a range up to 600ft. Can be worn on wrist, belt clip, around neck or attach it to walker or wheelchair. No activation costs, no contracts and no monthly fees. System has standby emergency battery power. Traceability through phone system caller id. Fully portable, tiny and lightweight.